The Battle of Ramsour’s Mill took place on June 20, 1780 near present-day Lincolnton, North Carolina, during the British campaign to gain control of the southern colonies in the American Revolutionary War. 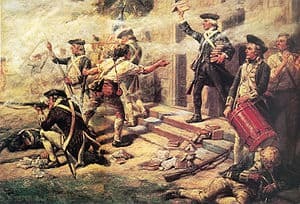 About 400 American militia defeated 1,300 Loyalist militiamen. The battle did not involve any regular army forces from either side, and was literally fought between neighbors. Despite being outnumbered, the Patriot militia defeated the Loyalists. The battle was significant in that it lowered the morale of Loyalists in the south, weakening their support of the British. On June 18, 1780, Patriot General Griffith Rutherford, who was camped near Charlotte, North Carolina, learned that a large force of Loyalists was assembling at Ramsour’s Mill, near present-day Lincolnton. Rutherford began moving his troops in that direction, and on June 19 he sent orders to Lieutenant Colonel Francis Locke and other local militia leaders call up their militia. Locke gathered a force of 400 cavalry and infantry at Mountain Creek, about 16 miles (26 km) to the northeast of Lincolnton. Their intelligence showed that the Loyalist force was more than three times their size, but it was decided to attack early the next morning without waiting for Rutherford’s forces to join up. At daybreak on June 20, they were one mile from the Loyalist camp, located on a hill about 300 yards (270 m) east of the mill belonging to Jacob Ramsour. Loyalist John Moore had served with the British at the Siege of Charleston and returned to his home a few miles from Ramsour’s Mill with tales of battle. He called together a group of about 40 Loyalists on June 10 and shared with them instructions from Cornwallis that for safety they should avoid organizing before British troops entered the area. News came to the meeting that a group of about twenty Patriots was looking for Moore and other Loyalist leaders. Moore and his men decided to find and confront them, but were unsuccessful. Moore then told his men to return home, and instructed them to join him in a few days at Ramsour’s Mill. On June 13, 200 men arrived there, and the number grew in the following days, buoyed by news of the British victory at Waxhaws. By June 20 the Loyalist camp had grown to about 1,300 men. When the cavalry leading the Patriot column approached, the Loyalist sentries on the road fired at them and retreated to their main body. After an initial cavalry charge, the Patriot infantry moved up. In the confusion of the battle, the Patriots were able to turn the Loyalist’s flank and gain control of the ridge. General Rutherford, then only a few miles from Ramsour’s Mill, received word of the action and immediately dispatched his cavalry to assist and hurried the infantry along. Patriot Colonel Francis Locke was unable to reform his line on the ridge and ordered his men to fall back. However, Captain John Dickey refused and led his company to higher ground, where their rifle marksmanship turned the battle into victory. When ordered to retreat by Colonel Locke, he had soundly cursed (Presbyterian elder though he was), saying he would not retreat. Captain Dickey was credited with saving the day at the Battle of Ramsour’s Mill. While brave Captain Dickey commenced the attack. The Loyalists were in disarray and many fled. When Colonel Rutherford reached the field he was met by a white flag, and the Loyalists requested a truce to treat the wounded. Rutherford, whose entire force had yet to arrive, instead demanded an immediate surrender. As the discussions went on, most of the remaining Loyalists fled, and only about 50 were taken prisoner. Casualties were difficult to assign since almost no one was wearing any sort of uniform. Estimates of dead on each side were between 50 to 70, with about 100 wounded on each side. The battle, in which muskets were sometimes used as clubs because of little ammunition, was fought between “neighbors, near relations, and friends”. Their defeat so badly demoralized the Loyalists that they never organized again in that area. Moore and about 30 men managed to reach Cornwallis at Camden, where Cornwallis threatened him with charges for disobeying his orders.